I know I have a problem. Okay, an obsession. 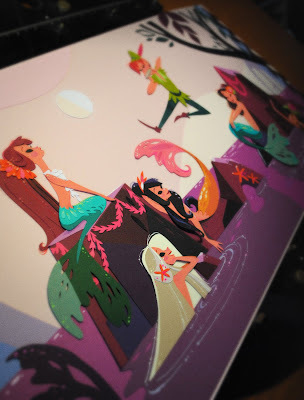 But when I was recently asked to create a new piece for a Disney Fine Art event a few weeks ago, the mermaid lagoon scene from Peter Pan was all I could think about. I thought it would probably be best to go ahead and get it out of my system before things got out of hand. I have been keeping busy working on several projects and getting ready for CTN-X next week! If you happen to be going to the show, you can find me at Table 56 right next to my good friend and fellow mermaid enthusiast, Liana Hee! I should have more updates before the show, but until then have a lovely week! There are not enough exclamation points and capital letters to express my love of this! Absolutely stunning - graceful and beautiful. your work is amazing! Fine art! you're gorgeous, keep the great job going and inspiring! big hug! So beautiful! Always amazed at the atmosphere you capture! I love the little details in the water highlights and the sparkles in the hair! Ill pop by and say hello next weekend! Argh i love this so much!! Great colors! The mermaids are great!! very impressive !! great colors . Beautiful Piece Brittney! You perfectly recreated that scene in your own style. Love it! Great work! I love the colors! Very beautiful work. I just saw this in the hall yesterday it's brilliant , great seeing you yesterday ! Love this. Happens to be my favorite part of Neverland as well! Sigh. So beautiful! Someday I hope to own one of your paper mermaids. Lovely, lovely. omygosh this is so amazing. I'll see you at CTN! woo hoo! This is outstanding! Might you make prints of this? peter pan was always one of my favorite stories! thanks for bringing it to life! your work is amazing! please keep sharing it! Beautiful! I love the blonde mermaids hair flowing into the water behind her and the one who's tail is half in the rock's shadow. that was colorful,it was really beatiful. I love this one!!! So beautiful! AAAHH!! THIS IS AMAZING! It doesn't help that I loove mermaids! Gorgeous! I don't know how you do it everytime but your talent is incredible! Very beautiful! I wish I could express my writing in the way you did this creation! ABSOLUTELY Fabulous!!!! I'm in love in so many ways! Please, Please, PLEASE make prints of this available!! Will the original be available for sale?? Where and When? I adore this!!! Peter Pan is my favorite! I think you captured the scene perfectly! Your piece is amazing! And Peter Pan is such a lovely character! I always love your mermaids. They're so beautifully designed, not to mention elegant. I'll be going to CTN as well! Hope to see you there. My favorite part too! Beautiful work. I'm truly in love with your work!! Beautiful work! I like the composition and colors in this piece! Your art is so inspiring! very sweet ! So ! That's beautiful ! I love your work. And the subjects you choose to draw. I love your fanarts of Harry Potter and The Little Mermaid. Congratulation for all your work. Are you on Deviant art ? It was great meeting you at ctn! AND I LOVE IT. Keep up the awesome work!!! Wow. This is just stunning. Beautifully done! What kind of paper art is this? hey i like your blog..its pretty cool! I love your work! It´s amazing and probably everyone says this to you but It´s really beautiful; well, I´m fourteen and i hope I can draw as pretty as you whan I grow up! Had to find your site after seeing your Christmas Tinkerbell piece on the D23 Facebook page. Love love love your work! Oh my goodness, Peter Pan is my absolute favorite too! Oh please oh please make this a print! I love your mermaids :)! You're such an inspiration! Your disney work is beautiful (and your other work as well). I love it all. Omg, just pure talent! Srsly, how is it possible? Your other Disney work is also pretty amazing �� You learned this by yourself, or did u have any teachers, or anything? I find your art really beautiful, and I see I am not the only one. They have grown quite refined over the years, progressing from brute force hacks to elaborate cloud-based applications that scan your device and automatically source the best root method for it from a database.